Fred+Ginger Flip-Tops are a fun and quick project which integrate many of the design features of the Fred+Ginger Cardigan. 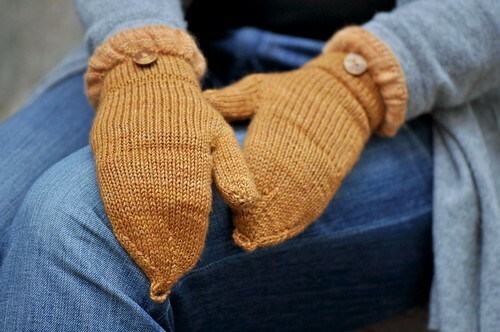 These mittens are worked with a tidy knit-in hem, twisted ribbing, seamlessly picked up flip-tops and an innovative integrated button loop. The ruffed edging can be worked in a coordinating or contrasting colour. Great for those small amounts of leftover lace yarns! 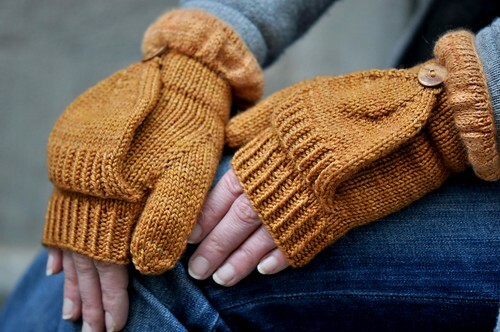 Body of Mitten - Sport or DK weight yarn. 135 (185, 225) yds / 123 (169, 206)m.
Shown in Sweetgeorgia Yarns Superwash Sport (100% superwash merino wool; 256 yds / 234m per 4oz / 115g skein) - 1 skein in Ginger. Shown in Sweetgeorgia Yarns CashSilk Lace (45% cashmere, 55% silk; 400 yds / 366m per 1.75oz / 50g skein) - 1 skein in Ginger. 24 sts and 32 rows = 4” / 10cm square in Stockinette Stitch in the round on US 4 / 3.5mm needles. 4 page PDF pattern includes photos and abbreviations. Measurements in imperial and metric.